So... More baking with my nanny kids. The little girl is getting really good, she'll be going pro soon! I found this new site, Love and Oil, another blog, which is where I got the recipe from. They do some awesome stuff! I think they are vegan or lactose intolerant or something because they always use different forms of milk and no eggs and not much butter but the cupcakes still turn out great! 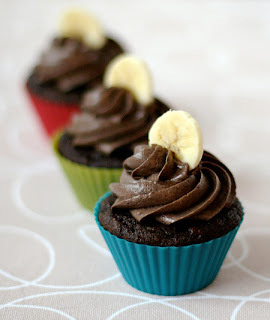 The banana made them really moist, which is really yummy! We didn't use the frosting recommended in the recipe because there wasn't really enough time, (we just used the butter, cocoa and icing sugar recipe from my other cupcake post) but I would definitely recommend trying it, it looks amazing! I'll post a picture of their ones too. So, another cheap cupcake anyone? Preheat the oven to 180°C. Line muffin tin with cupcake liners. In a small bowl, mash the banana with a fork. Whisk in the milk, sugar, oil and vanilla extract until incorporated. The mixture will still be a little lumpy because of the banana, but whisk out as many large lumps as you can. In a separate bowl, sift together the flour, cocoa powder, baking soda, baking powder, salt and cinnamon. Make a well in the centre of the dry ingredients and pour in the banana mixture. Stir until just smooth (do not overmix). Pour into the liners, filling each until about 2/3 full. Bake for 18-20 minutes or until a skewer comes out clean. Cream butter until smooth and fluffy, 2-3 minutes. Add the banana and mix on high speed until few lumps remain. Add cocoa powder and 1 cup icing sugar and beat until combined. Continue adding icing sugar, a 1/2 cup at a time, mixing well after each addition. Mix in vanilla. Continue beating until light and fluffy, about 3-5 minutes, adding more sugar if necessary. Spread or pipe onto cooled cupcakes and garnish with some leftover banana slices. Taken from "Love and Oil".